May 14th was cold, really cold. Like, finger-numbing-rose-cheeks-runny-nose kind of cold. Which, might make you think it would ruin an out door festival but you’d be wrong. 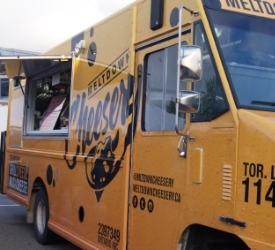 The only thing that could possibly ruin Whitby’s Food Truck Frenzy would be not going or maybe a tornado. But tornado’s have a tendency to ruin everything anyway. 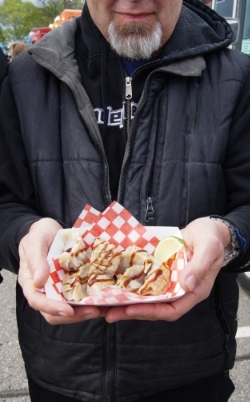 Food truck festivals can be overwhelming when you first arrive. There’s crowd’s of people and there’s a ton of trucks and menu items to choose from. Last year it took us 2 1/2 laps before we felt confident about what we wanted to try. Which, looking back was a great idea. I recommend doing a couple laps if you go next year or if you plan on going to another one this summer. I mean, the worst thing that could happen is that you build up an appetite, right? Unlike last year, my friends and family had experience on our side so it took us a lot less time to get our bearings, or maybe more motivated because of the cold, so we couldstart eating. Last year we shared everything we purchased and this year was no different. 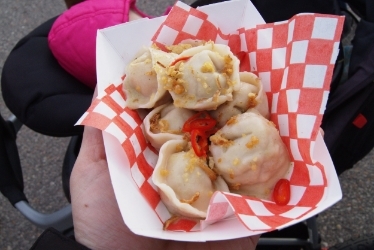 Doing the festival like that enables us to try way more dishes than we possibly could have on our own. To me, this makes the festival what it is, and truly makes it a frenzy. The group of us circled our prey and devoured every delicious bite. What remained was definitely less appetizing than what was served. 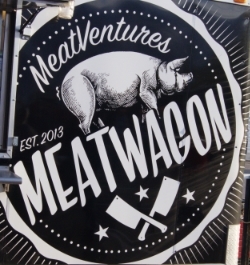 Last year my favourite dish came from Meat Ventures, Meat Wagon. I knew that I wanted to visit them again because I loved what they did. They didn’t disappoint but unfortunately, they didn’t win my favourite dish. That went to Great Canadian Food Truck with their Alberta Braised Beef Sammy. It was comfort food at it’s best. The beef was tender and juicy, the onion’s sweet and the horseradish cream topped it off perfectly. The dish is a win, especially on a cold spring evening. They were super kind and you could tell they loved being there, even though it was so freaking cold. If you see them around this summer order their food and give them a high five! I love this festival, I really do. It’s so good to see these kind of festivities take place in Durham region. Growing up in the area I always felt like the Durham region lacked character. It’s events like these that help fill that void. A special thanks goes out to the Rotary Club of Whitby for putting this together. 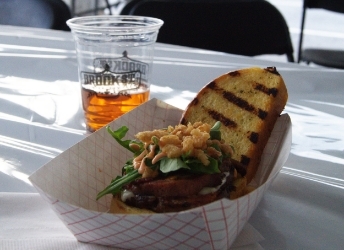 I can’t wait for next years Food Truck Frenzy!